Alfred James Golden Jr. (born July 4, 1969) is an American football coach who is currently the linebackers coach for the Detroit Lions of the National Football League (NFL). He is a former head coach at Temple from 2006 to 2010. 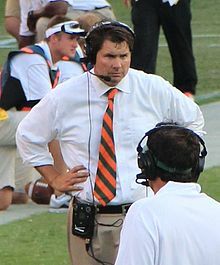 He has also served for five years as defensive coordinator at Virginia (2001–2005) and five years as the head coach at University of Miami (2011–2015). He is also a former tight end for the New England Patriots of the NFL. He was fired from Miami on October 25, 2015. Golden was a three-year (1989–1991) letter winner and tight end for Penn State, where he received the 1991 Ridge Riley Award, given annually to a player who displays excellence in scholarship, sportsmanship, friendship, and leadership. As a junior in 1990, Golden played a key role in Penn State's nationally televised 24–21 upset of #1-ranked Notre Dame at South Bend. His touchdown reception late in the fourth quarter tied the score at 21 as Penn State rallied from a 21–7 deficit. Golden was named captain of the Nittany Lions his senior year and helped lead them to a 42–17 win over University of Tennessee in the 1992 Fiesta Bowl, an 11–2 record, and a #3 ranking in the final 1991 AP Poll. Golden spent the 1992 season in the National Football League with the New England Patriots as a tight end. Golden began his coaching career in 1993 as offensive coordinator at Red Bank Catholic High School in Red Bank, New Jersey. He then served as a graduate assistant under George Welsh at University of Virginia from 1994 to 1996, where he worked primarily with the linebackers and special teams. He helped develop All-ACC linebackers James Farrior and Jamie Sharper, both of whom were chosen in the 1997 NFL Draft. He then coached linebackers at Boston College from 1997 to 1999 under Tom O'Brien. While at Boston College, Golden coached All-Big East linebackers Frank Chamberlin and Erik Storz. The Eagles finished the 1999 regular season with an 8–3 record and a top-25 national ranking, while making their first postseason bowl appearance since 1994. Named defensive coordinator by Virginia head coach Al Groh in 2001, Golden became the youngest defensive coordinator in Division I-A. He had spent the previous season at his alma mater, Penn State University, serving as linebackers coach and recruiting coordinator under head coach Joe Paterno. From 2001 to 2004, the Cavaliers' defense improved under his tutelage, ranking 108th in total defense in his first year to ranking 18th in total defense in 2004. In the same time period, Virginia's scoring defense went from 74th in the nation (27.6 ppg) to 17th (17.7 ppg) utilizing Golden's 3–4 defense. Golden was named head football coach at Temple University in December 2005, as the second-youngest head coach in NCAA football at that time, behind Northwestern's Pat Fitzgerald. Temple had a record of 3–31 during the three years before Golden was hired, and had just been thrown out of the Big East Conference for non-competitiveness. In Golden's first three years at the helm, Temple recorded 1–11 in 2006, 4–8 in 2007 and then 5–7 mark in 2008. The 2008 record was the best for the program since a 7–4 mark in 1990. The Owls finished the 2009 regular season at 9–3, their first winning season since 1990. It was also their best record since 1979, the last time they appeared in a postseason game, before facing the UCLA Bruins in the EagleBank Bowl on December 29, 2009. After leading for three quarters, the Owls fell to the Bruins 30–21. Golden was interviewed for the vacant head coach position at UCLA in December 2007. However, he withdrew his name from consideration on December 26, 2007, choosing to stay with the up-and-coming Temple program. Following the 2009 season, he was a candidate for the head coaching position at the University of Cincinnati vacated by Brian Kelly, who departed for Notre Dame. He later asked that his name be withdrawn from consideration from that position. That same offseason, he was also a candidate for the job at Tennessee vacated by Lane Kiffin, who went to Southern California. In May 2010, Golden signed a contract extension with Temple through 2014. He led the Owls to an 8–4 record in 2010. On December 12, 2010, ESPN reported that Golden was offered and accepted the head coaching job at the University of Miami. In press conference remarks upon his hiring on December 13, 2010, Golden emphasized the importance of the University of Miami football legacy. "It's the most recognizable brand in college football," he said. "I go back to the former players that are here, the five national championships, 20 national award winners, countless All-Americans, incredible tradition. It's a dream job." Golden signed a five-year contract at an undisclosed salary on December 14, 2010. However, due to NCAA rules, Golden did not coach the football team in Miami's bowl game against Notre Dame but instead focused on recruiting players for 2011. Despite fielding teams with multiple future NFL draft picks, Golden was unable to defeat Florida State, his in state rival, in 5 attempts. Golden began his tenure hampered by probation from a previous booster scandal, and self-imposed bowl bans during Golden’s first two years with the program. Golden posted a 6–6 record in his first year at the University of Miami. The 2011 season was only the third time since 1979 that the program had failed to register a winning record. Despite being bowl-eligible, Miami announced on November 20 that it was withdrawing from bowl consideration due to an ongoing investigation into the program's ties to convicted Ponzi schemeer Nevin Shapiro. The Hurricanes registered a 7-5 record in 2012 and were in contention for a Coastal Division title for much of the year. However, with the NCAA investigation still not resolved, on November 19, Miami announced it was withdrawing from bowl consideration for a second consecutive season. Reportedly, school officials remembered how Ohio State opted to play in a bowl in the 2011 season with an NCAA investigation still underway only to be banned from bowl consideration the following year. Golden's third season at Miami saw more improvement from the previous two. The Hurricanes got off to a 7-0 start, including a win over rival Florida, and were ranked as high as #7 in the AP Poll. Their first loss came to eventual National Champion Florida State, which started a 3-game losing streak for Miami. The Hurricanes ended the regular season at 9-3 (5-3 ACC), good for 2nd place in the Coastal Division. Golden's team was invited to the 2013 Russell Athletic Bowl, which the Canes lost 36-9 at the hands of future ACC foe Louisville. Golden's fourth season at Miami was seen as a disappointment by many. The Hurricanes began the season with a 6-3 record, but lost their next four games beginning with a heartbreaking home loss to defending National Champions Florida State and concluding with an uninspired defeat at the hands of South Carolina in the Duck Commander Independence Bowl. Golden's Hurricanes finished the season 6-7 despite being picked by many experts to win the ACC Coastal Division Championship and seven of its players being drafted by NFL franchises which was tied with Alabama for 4th most by a school, behind only Florida State (11), Louisville (10) and Florida (8). The Hurricanes began their season with a 3-0 start, with wins over Florida Atlantic University, Bethune-Cookman, and Nebraska. However, in their fourth game they were defeated by the Cincinnati Bearcats at Nippert Stadium. Fans clamored to see his immediate dismissal, even flying anti-Golden banners before games,. Even Florida State Seminoles fans got in on the act, attempting to raise money for their own "Keep Al Golden" banner with a GoFundMe campaign. Due to area banner planes being booked for the contest between the storied rivals on October 10, 2015, funds raised were instead donated to the Kidz 1st Fund charity organization in lieu of hiring a plane. Other reports suggested that Florida State and Miami officials pressured the campaign's manager to not fly the banner out of respect for the coach. During the buildup for that year's matchup, archrival Florida State sarcastically expressed their admiration for Golden's ability in leading the once mighty Hurricanes and began selling similarly themed "Keep Al Golden" T-shirts at their official bookstore. On the day of the game itself, fans posted mock "Missing Persons" notices throughout Tallahassee questioning the whereabouts of the formerly feared Hurricanes program as they welcomed them for their biennial visit to Tallahassee and FSU's Doak Campbell Stadium. On February 1, 2016, Golden was named tight ends coach of the Detroit Lions. On February 7, 2018, Golden was named linebackers coach of the Lions. A native of Colts Neck, New Jersey, Golden graduated from Red Bank Catholic High School, Red Bank, New Jersey, and earned his undergraduate degree in pre-law from Pennsylvania State University in 1991 before receiving his master’s in sports psychology from the University of Virginia in December 1996. A 2004 inductee of the Jersey Shore Sports Hall of Fame, he is married to Kelly Elizabeth Hanna of Lock Haven, Pennsylvania, and has a son, A. J., and two daughters, Addison and Grace. For most of his head coaching career, Golden wore a dress shirt, slacks, and a tie on the sidelines, unlike most coaches of his generation. ^ a b c d e f g h i j k "Golden named Temple head football coach". Temple Times. December 8, 2005. Archived from the original on December 25, 2010. Retrieved January 26, 2011. ^ Ruthenberg, Dave (December 26, 2007). "Golden To Remain with Temple". macreportonline.com. Archived from the original on July 14, 2011. Retrieved December 13, 2010. ^ Chris Foster, UCLA meets with Golden, Los Angeles Times, December 20, 2007. ^ Tatum, Kevin (December 16, 2009). "Golden not interested in the Cincinnati job". The Philadelphia Inquirer. ^ "Golden's contract extension is deserved". ESPN. May 15, 2010. Retrieved December 27, 2010. ^ Feldman, Bruce (December 12, 2010). "Source: Al Golden accepts offer to coach at Miami making $1,500,000 per year". ESPN.com. ^ MILIAN, JORGE (December 13, 2010). "Temple's Al Golden will be introduced tonight as Miami Hurricanes' new football coach". Palm Beach Post. Retrieved December 27, 2010. ^ "Golden's Miami Beginning: Meetings & Recruiting". University of Miami. Archived from the original on December 17, 2010. Retrieved December 27, 2010. ^ Miami won't play in a bowl game. ESPN, November 20, 2011. ^ Adelson, Andrea. Miami looks to its future with bowl ban. ESPN, November 19, 2012. ^ Hyde, Dave. .Sun Sentinel, September 6, 2015. ^ a b c Johnson, Joseph  GoFundMe, September 19, 2015. ^ Fanbuzz. fanbuzz, October 8, 2015. ^ Patterson, Chip. CBS Sports. ^ Dragon, Tyles (February 1, 2016). "Detroit Lions hire Al Golden to coach tight ends". NFL.com. Retrieved February 7, 2018. ^ "Lions coaching staff update". Detroit Lions. February 7, 2018. Retrieved February 7, 2018. ^ O'Gorman, George (February 1, 2010). "Local royalty honored at Sports Writers Banquet". The Trentonian. Archived from the original on April 15, 2012. Retrieved January 26, 2011.